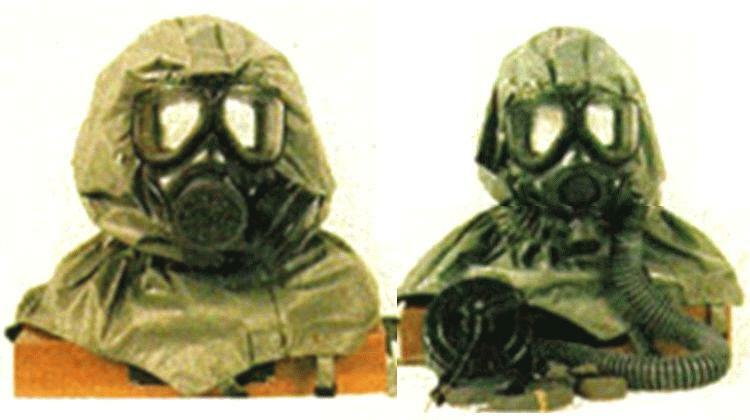 The M40 provides respiratory, eye, and face protection against chemical and biological agents. The mask consists of a silicone rubber face-piece with an in-turned peripheral faceseal and binocular rigid lens system. A face-mounted canister (gas and aerosol filter) can be worn on either the left or the right cheek. Microphone, hose and canister carrier are provided for combat vehicle applications. The mask is furnished in small, medium, and large sizes. Several mask improvements have been introduced through Pre-Planned Product Improvement (P3I) programs, which resulted in M40A1 and M42A1 configurations. The adopted initiatives included a quick-doff hood, second skin, canister interoperability (M42A1 only), and voice amplification (M7), new nosecup, two new carriers, and improved vision correction. An additional product improvement was adopted in Dec 94 which upgraded the M42 to the M42A2 configuration. This change provides detachable microphone that improves reliability, simplifies production, and permits field replacements. The second skin was developed for the M40 mask through the Pre-Planned Product Improvement program and is a covering for the mask faceblank material that provides added agent resistance. The material used in the second skin is a butyl rubber blend which has excellent agent resistance and is very durable. The second skin is designed to be compatible with a quick-doff hood and future overgarment with integral hood. The quick-doff hood is easily removed during processing through decontamination lines. Reports of comfort problems with the nosecup of the M40/M42 Mask resulted in a redesign for the M40A1/M42A1 Mask. The new nosecup contains an in-turned periphery similar to that on the facepiece and does not result in the irritation problems reported earlier. The canister interoperability system consists of three parts, a hose assembly, canister carrier, and armor quick disconnect (AQD). This hose assembly is attached to either side of the mask by the operator with a star knob while the previous hose assembly was permanently affixed to the mask. This permits the user to attach the hose assembly to the faceblank and the canister. The AQD can also be connected to the canister carrier for connection to the gas particulate filter unit when the canister is inside its carrier. The canister carrier has been redesigned from the original and is now compatible with a variety of NATO canisters. The M7 voice amplifier was developed for the M40 mask through the Pre-Planned Product Improvement program to improve face-to-face communication in an NBC environment. The amplifier can be attached to and removed from the front voicemitter of the mask while wearing CB protective gloves. The amplifier uses a standard Army battery for power. The weight of the unit is approximately 9 oz and does not have an adverse affect on the seal of the mask. The MSDS and Toxicity Characteristic Leaching Procedure Results information will provide environmental offices on military installations the means to make a determination whether the C2A1 Canister, NSN 4240-01-361-1319, can be disposed of in ordinary trash or must be handled as a hazardous waste material based on their state and local environmental laws. Basis of Issue: One-for-one replacement for the M17 series, M25 series, and M9 series for Army and USMC.